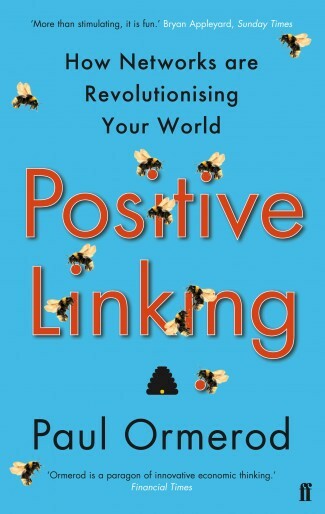 A review of ‘Positive Linking’ by Paul Ormerod. If you’ve read ‘Nudge’ and thought “yeah, I get it but I don’t think behavioural economics is going to save the world on its own” — then this might fill in a few of the gaps for you. Paul Ormerod is far from opposed to nudge theory and how we can be positively influenced by incentives, but he does feel that it’s far more powerful when you combine nudge with network theory. The author clearly and simply explains the power of networks and the influence they can have on our decisions. Whilst many examples are drawn from maths and economics, there is a welcome lack of equations in the book and everything is super simple to follow. What you get through examples ranging from Facebook, the hangings of Protestants by Queen Mary in the 1500s, football riots and a man ironing his shirt on the M1; is a compelling book outlining how we are influenced in our decisions through the complex networks that surround us. Ormerod’s argument is that if you are trying to influence behaviour of a group then you need to look at what type of networks are impacting on it. … the impact of networks can be considerably greater than that of incentives alone. If the two operate in conjunction, if we experience the phenomenon of positive linking, the changes to behaviour of a relatively small number of people which incentives might induce can spread across a larger group because of network effects. He goes on to help identify situations whereby you can detect if a network effect may be having an influence on behaviour. If you’re into marketing then I would say this is fairly important stuff for you to read as it starts to break open the mystery of why certain campaigns go viral and why others bite the dust — and it’s more than just trying to identify key influencers in the network. Ormerod outlines three main types of network, how to identify each and then how to best start influencing it. Positive Linking is follow-on thinking from Paul Ormerod’s previous books, The Death of Economics and Butterfly Economics, but you’ll have no problem starting here. And for the Photoshop users amongst you, you’ll even meet Carl Friedrich Gauss who brought you Gaussian Blur as well as being one of the greatest mathematicians of all time.